Billie Holiday may have crooned glorious praises of “Autumn in New York,” but there’s no time quite like spring in the city. When winter’s cold finally lifts, up go the windows, rooftops are opened, and everyone collectively comes out to play. This year, embrace the sunnier side of life to the fullest with these hot drinking spots sure to make you feel like you’re finally on the vacation you deserve. 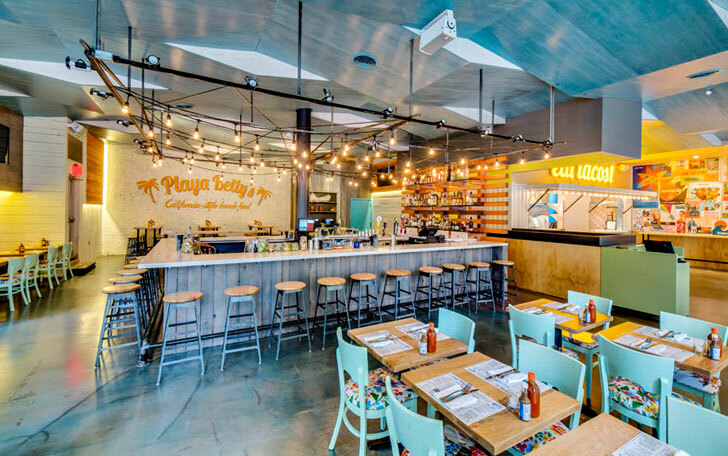 Californians, real or aspiring, will feel right at home at Playa Betty’s, a restaurant and bar that takes its cues from the sunny coastline of Southern California. Inspired by the views and vibes of a road trip from Mendocino County down to Baja, the Upper West Side joint is all about good vibrations, slathered in teal and strung with bulb lights hanging above surf paraphernalia decorating the walls. A big light-up sign implores guests to “eat tacos!”—which they do, along with healthy build-your- own grain bowls and fresh guacamole, at communal wood tables ideal for mingling over rounds of margaritas. 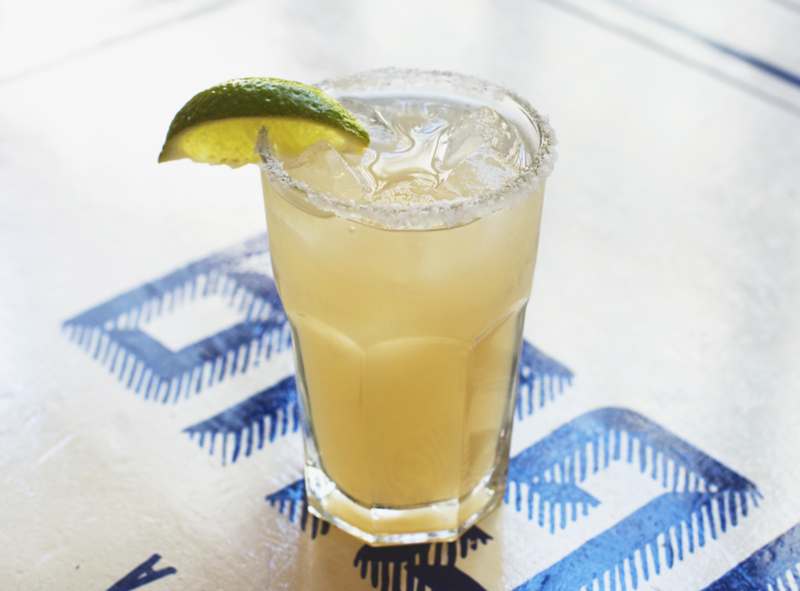 In addition to the classic, namesake Betty’s Margarita, there’s a Tamarind Fizz with tamarind-infused reposado, tamarind soda, and lime; a spicy jalapeño-infused margarita; and the sophisticated Smokey Playa with Aperol, passionfruit, and a rim of smoked salt. Right off the L train in Williamsburg, Surf Bar is an institution, a token tiki bar doused in the grit of Brooklyn past. One of the holdout dive bars on a street now home to third-rail coffee shops and designer stores like Sandro and Maje, Surf Bar seems to emanate its down-at-heel charm all the more. Through its ramshackle wooden door are sand-covered floors, tables covered in waxy tablecloths, lobster rolls and fish-of-the-day specials, and, most importantly, cheap drinks. No craft cocktails here—just saccharine Mai Tais and mudslides, margaritas and mojitos either frozen or on the rocks, and a menu section devoted solely to rum-based tiki drinks that range from the pineapple- tinged Blue Crush (that is, in fact, blue) to the Gorilla Milk, a boozy milkshake-esque concoction with coconut cream, crème de banana, and crème de cacao. Movie screenings of cult films loosely based around oceans, like Wes Anderson’s The Life Aquatic, happen on a weekly basis, adding to the relaxed appeal. 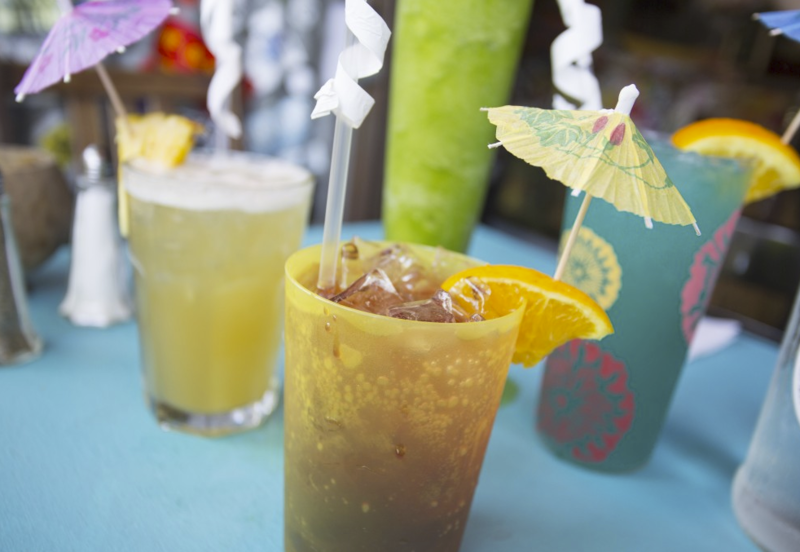 If Surf Bar is at one end of the tiki bar spectrum, Mother of Pearl is at the other, as its name alone suggests. This Polynesian-themed cocktail bar recalls more of a luxurious outpost in Bora Bora than a surf shack in Baja, with white bar stools topped in green leather lined by the tiled bar, fancy ceiling moldings, glittery globe light fixtures, and banana plants found on both retro floral textiles as well as in pots by the windows. 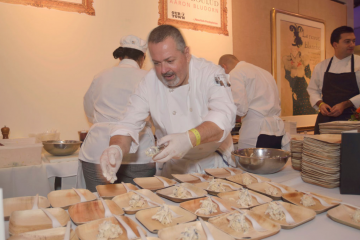 In warmer months, the front opens up to the street, which is just in eyeshot of Alphabet City’s Tompkins Square Park, making it an ideal spot for date nights. Light bites are vaguely themed around the tropics— edamame spring rolls, coconut steamed buns with miso butter and lava salt—but the elaborate, photo- worthy cocktails are the reason to come. 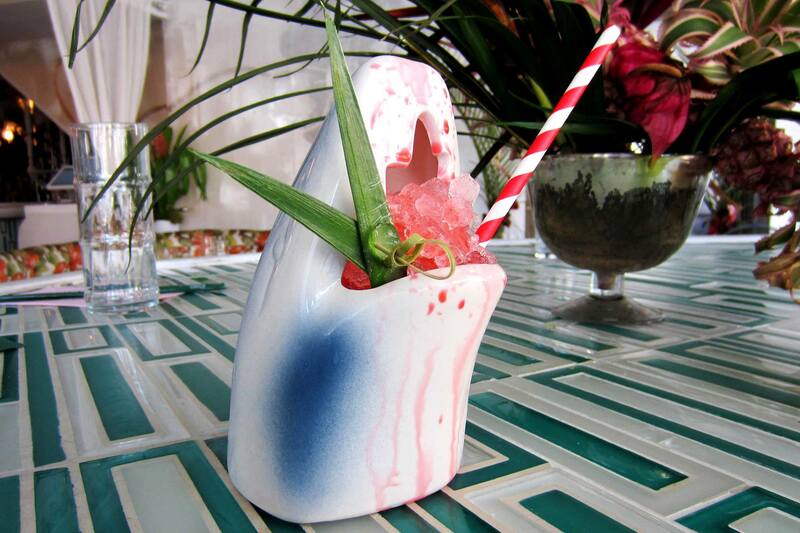 Take, for instance, the Shark Eye: the sweetness of passionfruit and maraschino cherries perfectly off set by bourbon, lemon, and bitters, served in glass shaped like the head of a shark. Restaurants come and go in Manhattan more quickly than the seasons can turn, but Nolita’s long-loved Tacombi at Fonda Nolita is one of the rare few that seems to never go out of style. No matter the night or the weather outside, Tacombi is buzzing with a clientele that comes to escape the city sidewalks and soak of the restaurant’s bright Yucatan beach atmosphere. The VW bus that the restaurant began in, selling tacos in Playa del Carmen, is now parked here inside Tacombi’s industrial garage space on Elizabeth Street and functions as the bar, with waiters climbing inside to dole out palmoas, pina coladas, mezcal mules, and margaritas until the late hours. It may not have the Playa’s rays of sunshine flooding in, but it does have enough margaritas, delicious tacos, and groovy tunes to raise endorphin levels enough to ensure you’ll leave with a cheeky grin. When the weather warms up, it means it’s time to relocate drinking experiences outdoors. 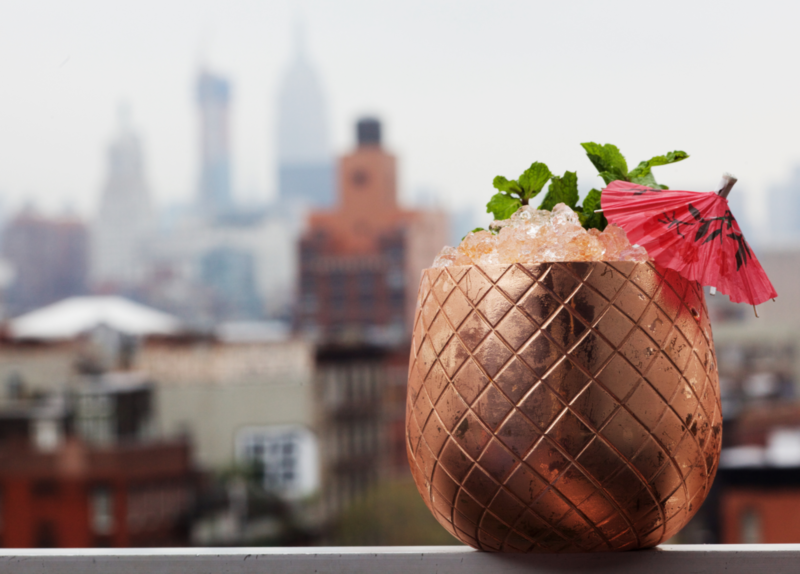 On the rooftop of the Lower East Side’s Sixty LES hotel, Tiki Tabu takes drinkers to loftier heights and tropical states of mind, paired with skyline views and a nice breeze to boot. Deep sofas covered in palm-frond fabric are ideal for evening lounging with a refreshing Tabu (Absolut, Amaro, ginger, lime, and soda), Asian bar snacks, and people watching an after-work crowd of chic young downtown things. On weekends, the potent Poison Dart (rum, chartreuse, pineapple, lime, and spices) gets nights going at this hotspot, where DJs spin beats and giant lava lamps light the mural-covered dance floor. 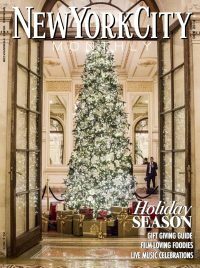 New York’s Dream hotels have been known for their fast-paced flashy clubs that often require a name on a guest list to enter. However, the latest addition to the Dream Midtown, Fishbowl, is quite the opposite—a fun, funky watering hole that invites everyone to come take a sip. Down in the hotel’s basement, the sparkling new bar not only has craft cocktails and a chic retro style (tiled floors, comfy big banquettes), but also entertainment options to spare, making it something of the basement everyone wanted when they were young. 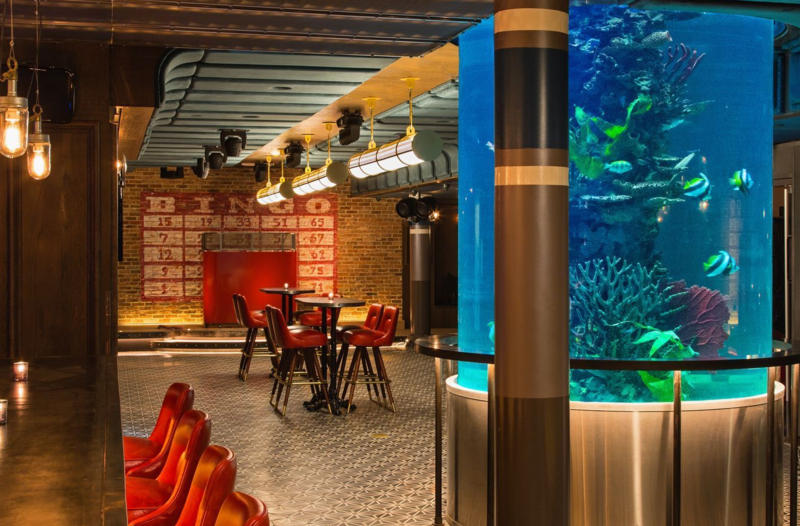 There’s Skee-Ball, miniature bowling lanes, and a centerpiece floor- to-ceiling glass aquarium filled with rainbow-colored fish and coral. Think of it as a tropical playhouse for adults.